Creeks TOPS players having fun playing soccer with their friends. (PRLEAP.COM) To many, soccer is the top sport in the world. The game certainly has international appeal through the World Cup and the Olympics. It is a sport that has a long history of competition, tradition, pride, and team spirit. Soccer is also a great community sport for children and adults of all ages and abilities. 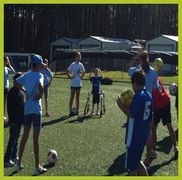 At Creeks Soccer based in St. Johns, Florida, just south of Jacksonville, there is a soccer program known as TOPS (The Outreach Program for Soccer) that is making a world of difference for the players, trainers, volunteers, parents, and coaches. Creeks Soccer has supported TOPS for more than 10 years. 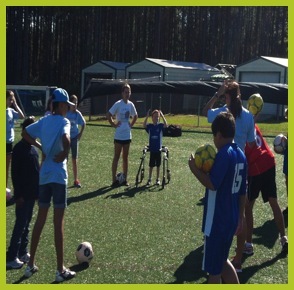 It was established by US Soccer in 1991 to provide young players with disabilities an environment filled with meaningful learning, developmental and physical participation opportunities through the game of soccer. TOPS soccer is designed to improve the overall fitness, self-esteem, and social skills of its players. TOPS players range in age from five years old to players in their early twenties (TOPS has no age limit). Each player is paired with a buddy who is there to guide and encourage the player throughout a variety of soccer activities and games. Buddies range in age from teens to adults. Serving as a buddy is a great way to give back to the community and make a difference in the day and life of a TOPS player. David Quackenbush has two daughters who are TOPS players. The twins just love soccer and are an important part of the TOPS program at Creeks Soccer. Quackenbush noted that, "TOPS soccer has been an amazing program for my daughters and me. Emily and Sarah have mental challenges. Because of this, they do not have the same interactions with friends that kids should have. The TOPS soccer program allows them to get some exercise and also interact with friends on the field. They love their coach and locate him as soon as we arrive to practice. On Sunday mornings, they ask to put on their soccer uniforms as soon as they get up." On a recent Sunday, Jim White, a board member and treasurer of Creeks Soccer, brought his 14 year old son Casey out to the TOPS Program to fulfill some of his church's community service hours as a buddy. Casey plays in the Creeks Soccer premier program and has great soccer skills. More importantly, Casey brought his spirit and support out to the fields to train and play with the TOPS athletes. As noted by Jim White, "It was great to see Casey out there using not only his foot skills but his heart in working with these wonderful kids. It was a great experience for Casey and the kids out on the field." At Creeks, the players are divided into two teams based on their skill. Players learn how to dribble, pass, and shoot through activities similar to those taught to all youth soccer players. When the skill training is complete, the older players have the chance to play in games with other players of similar ability. For the younger players, Creeks has a variety of games from scoring on Coach Mike to parachute ball! Scott Hiltonen is the Director of the Creeks Soccer TOPS Program. He coordinates the training and volunteers for TOPS. Over the years, Hiltonen has noticed the positive impact that the TOPS Program has on the players, buddies, parents, and volunteers. As noted by Hiltonen, "TOPS Soccer takes a great group of kids and players from the sideline to participating in the game. Just talk to any of the participants and parents and you understand the positive impact of TOPS Soccer. Volunteer or attend a training session and you will actually experience it." The program is run concurrently with the Creeks Soccer season, offering about 10 sessions in the Fall and another 8 sessions in the Spring. TOPS Soccer furthers US Youth Soccer's mission of fostering the physical, mental and emotional growth and development of America's youth through the sport of soccer at all levels. Gilberto and Jenny Carrera also have seen the impact of the Creeks TOPS Soccer program on their son, Ethan. Carrera stated, "Seeing our son interact and engage in all of the activities was a very satisfying feeling. He had a great time and was always excited to attend his soccer training. It was not only a fun time that he greatly enjoyed but it also was a very good physical session for him." The world's greatest sport truly is making a world of difference for the players, coaches, volunteers, and parents at the Creeks TOPS Soccer Program. If you have a child interested in participating or a child over the age of 12 who would like to be a buddy, visit www.CreeksSoccer.com and click on TOPS. For more information or to sponsor Creeks TOPS, contact Scott Hiltonen at Scott@CreeksSoccer.com.